One of the main benefits of practicing yoga is flexibility. The yoga asanas allow us to become more limber in our bodies, bodies that are stiff from sitting all day at computers, on commuter trains, and flaking out on couches watching television. According to the Toa Te Ching, Whatever is flexible, and flowing will tend to grow, whereas whatever is rigid and blocked will whither and die. As yogis we stay fluid, young and supple through the practice of yoga asana. However, as we’ve been learning in this Benefits of Yoga Series, the yoga asanas are only a tool and a starting point. A flexible body allows us to be flexible in our minds, emotions and spirits as well. I can think of so many examples in my day to day life where I am asked to be flexible. 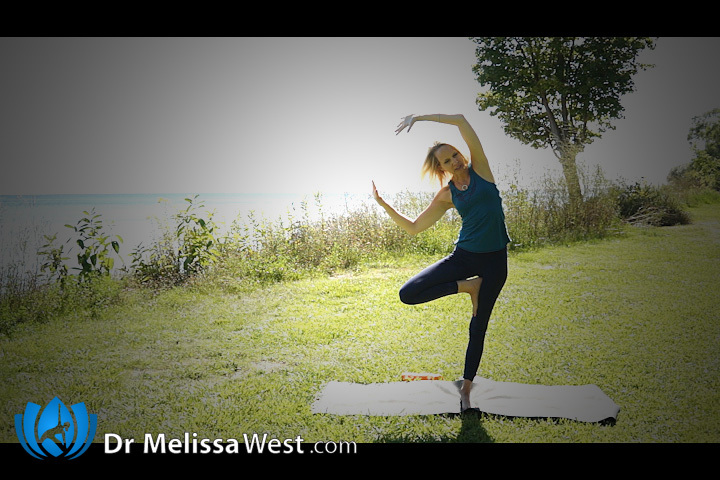 Almost every time when we are choosing a location to film Yoga with Melissa, I might have an idea in mind and inevitable Tim will have a different idea in mind. Things won’t always go as planned. This example alone has tested me again and again on how flexible I am. You’ve all heard that saying, “As long as everything is exactly the way I want it to, I am totally flexible.” Now that I have awareness of these moments I see these points in relationships where I might not get my own way and have the opportunity to compromise are an occasion to practice being flexible. As yogis we learn to be flexible in our bodies so we can be fluid in our emotions. We learn to move through our emotions like a river flowing around any obstacles on its path. The water of a river adapts to whatever route is available. When we practice yoga, we have the skill of flexibility to take off our yoga mat and therefore we are able to feel our emotions fully, yet not get stuck in them. We can feel happiness, sadness, anger, curiosity, and flow through a full range of emotions. Today we are going to focus on how this flexibility helps us in our life. Of course as we learned in our first class in the benefit of yoga series strength goes together with flexibility. So it is important to stay committed to your intentions/sankalpa but allow yourself to be flexible in your approach. As they say, “When nothing goes right, go left” We can be flexible. In today’s class we are going to focus on opposition of tree pose and eagle pose, and this quote that was the inspiration for this class, “If you don’t like where you are, change it, you’re not a tree.” As yogi’s we can be flexible, even as trees, we can be rooted and grounded, and we can bend in the wind, after all, “It’s better to bend, than to break.” On top of that, we can take on the qualities of the eagle and choose to move wherever we want in life. Eagles pose requires flexibility in our joints. Just like our flexible joints, our thinking can be flexible, gentle, tolerant, bending, praising, complementary and yielding. Our joints allow us to freely express ourselves, they allow us to join up our thoughts and feeling with our actions. They allow us to move with grace and comfort. Fluid joints mean thoughts and feelings that express acceptance and affirmation in the world.